Written and directed by Ruben Ostlund, Force Majeure is the story of a family vacation at the French Alps nearly goes wrong when an avalanche nearly kills them. The film is an exploration into the world of family and how people react towards near-fatal catastrophes. Starring Johannes Bah Kuhnke, Lisa Loven Kongsli, Clara Wettergren, Vincent Wettergren, Kristofer Hivju, and Fanni Metelius. Force Majeure is a captivating and provocative film from Ruben Ostlund. 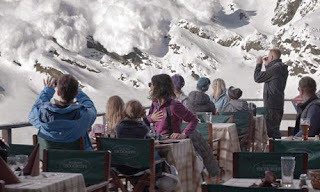 Set in a ski resort in the French Alps near Savoie, France, the film revolves a week in the life of a Swedish family on a holiday where a near-fatal encounter with an avalanche forces a couple to come into question about their reaction. Most notably as the husband-father Tomas (Johannes Bah Kuhnke) ran from his own family during the event as his wife Ebba (Lisa Loven Kongsli) wondered why he did that. It’s a film that plays into a family questioning not just its patriarch over what had happened but why as he goes into denial and such. Ruben Ostlund’s screenplay does play into a traditional narrative structure as it plays into the days of the week where the first day is fine. Yet, it is the second day where the avalanche happens as it becomes about not just Tomas’ action or lack of for his family but also in how things start to fall apart as Tomas’ own children are upset with him. Its second act involve the visit of a couple of friends of Tomas and Ebba who try to make sense of what happened as it leads to many questions about how someone would react into that kind of situation. Ostlund’s direction is very mesmerizing for the way he creates a simple family drama that is set on location in this ski resort on the French Alps. The location itself is a character in the film as Ostlund uses a lot of wide shots to capture the look of those mountains as well as knowing where to place the camera for the event that would shape an entire family. There aren’t a lot of close-ups in the film as Ostlund prefers to showcase a film about an entire family where a lot of medium and wide shots are used. The compositions showcase how close they are early in the film such as the fact that they all share the same bed. Once they all had encountered the avalanche, the framing becomes evident into how troubled the family is as there’s a shot where a hotel cleaner watches as he would appear very often. The direction also have Ostlund maintain an intimacy with the scenes inside the hotel suite Tomas, Ebba, and their children live in as he knows how to frame a moment such as the family brushing their teeth or the scene where their friends to discuss what happened. The sense of tension does emerge as well as moments that are very emotionally intense as it relates to Tomas and Ebba each going into their own personal journeys to cope with everything that had happened. There’s also some moments that involves a drone that Tomas had bought which does kind of add an element of suspense but also play into how immature Tomas is at times. One notable scene in the film’s third act doesn’t just play into a family coping with near tragedy but also in a moment where they would have another dangerous encounter that actually mirrors a real-life moment where a bunch of people nearly got killed as it is about a simple human reaction and what a person would do in this situation. Overall, Ostlund creates a very engrossing yet powerful film about a family coping with near-tragedy and its aftermath. Cinematographer Fredrik Wenzel does amazing work with the film‘s cinematography to capture the vast look of the locations in the Alps with its naturalistic look of snow as well as some unique lighting for some scenes set at night including the scenes inside the hotel. Editor Jacob Secher Schulsinger does excellent work with the editing as it‘s very simple by not going for any kind of conventional fast-cuts by employing something that is more methodical while knowing when to cut for a transition or use a rhythmic cut for a dramatic moment. Production designer Josefin Asberb does superb work with the look of the hotel halls and some of its rooms as well as the hotel suite that Tomas, Ebba, and their children live in. Costume designer Pia Aleborg does nice work with the costumes as it‘s mostly casual to play into what the family wears in and out of the resort. Visual effects supervisors Samir Arabzadeh and Hakan Blomdahl do fantastic work with some of the film‘s minimal visual effects such as the avalanche sequence and other parts to play into the cold weather. Sound editors Andreas Franck and Gisle Tveito do brilliant work with the sound editing to play into the sound of snow winds and other parts such as the cannons at night to help create the sense of drama and tension that looms into the film. The film’s music by Ola Flottum is wonderful for its low-key ambient score that is use quite sparingly as most of the music is played on location from electronic dance to a classical piece by Antonio Vivaldi that serves as an effective dramatic piece for some of the film’s transitions. The casting by Katja Wik is great as it features an appearance from Brady Corbet as an American tourist who dines with Tomas and Ebba, Karin Myrenberg as a friend of Ebba who is dating the American as she talks about what Ebba went through, and Johannes Moustos as the hotel cleaner who would often observe things that is happening in the hotel. Kristofer Hivju and Fanni Metelius are excellent in their respective roles as family friends Mats and Fanni as the two try to observe what had happened as well as present their own views on the situation. Clara and Vincent Wettergren are amazing in their respective roles as Vera and Harry as the two kids who cope with what had happened with the youngest in Harry thinking that his parents will split up. Lisa Loven Kongsli is brilliant as Ebba as a mother of two kids who copes with what happened as she is angry at her husband for his reaction and lack of action. Finally, there’s Johannes Bah Kuhnke in a fantastic performance as Tomas as a man whose reaction to the avalanche makes him look bad in front of his family as he ponders if he didn’t do anything or had a different view of what happened. Force Majeure is a phenomenal film from Ruben Ostlund. Armed with a great cast, sprawling visuals, and an insightful story about simple human reactions to near-fatal events and other things makes it more than just a simple drama. Even as it manages to provoke many questions about how someone would react to these situations and such. In the end, Force Majeure is a spectacular film from Ruben Ostlund. Been hearing so many great things about Force Majeure. I like films that made you think about what you would do if you're in their shoes, sounds like this one did just that. It is such a phenomenal film as well as being very provocative about what someone would do in a situation like this. It is such a great film and needs to be seen by a wide audience.